Not only a full-featured automobile navigation system with turn-by-turn voice guidance, the StreetPilot 2730 offers real-time XM NavTraffic, XM WX Weather, and XM Radio capabilities (subscription required). It comes ready to go with no need to download maps from your PC. The StreetPilot 2730 uses the traffic data to automatically calculate and suggest faster alternative routes long before traffic starts backing up (this service requires an XM NavTraffic subscription). Users can send XM and navigation audio to their car stereo. The StreetPilot 2730 also comes equipped with an MP3 and works as an audio book player. 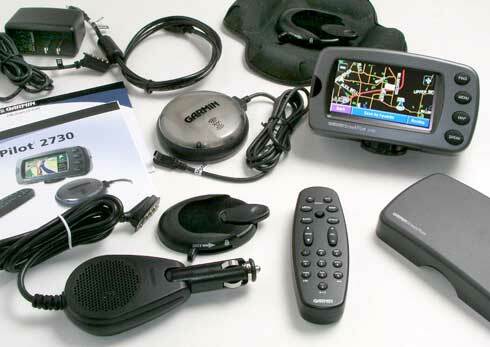 The Garmin StreetPilot 2730 GPS receiver, integrated wireless FM transmitter, GXM 30 smart antenna, dash mount, portable non-skid mount, external speaker with 12-volt adapter, AC power adapter, USB drivers CD, USB interface cable, remote control, protective cover, owner’s manual, quick reference guide. 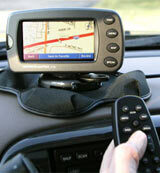 Optional accessories: Remote GPS antenna, deluxe carrying case, MapSource software. Although there are four buttons on the front of the unit, most of the controls are on the touch screen. The Menu Page is the central page. It has Where To (also known as the Find Page) and View Map as well as Stop, Detour, Tools, Settings, and Volume. Touching Where To brings up a page with the choices of Address, Food & Hotels…, Streets & Cities, Browse Map, My Locations, and Recent Finds. Browse Map brings up the map and allows you to drag and pan the map in order to find a nearby location. You can find places in a different area by choosing Near Here, Near Current Route, Near Destination, Near Other City, Near Current Road, and Near Recent Finds. To narrow the search, you can bring up a “keyboard” and type in the location. My Locations allows you to save the places you find, as well as save your current location and set a home location. You can also edit this information. While navigating a route you have the choice to view a list of all the turns on that route. The GPS Info Page (photo down the page a bit) shows the relative positions of the satellites you are receiving, the individual signal strengths of those satellites, your location coordinates, and your elevation. 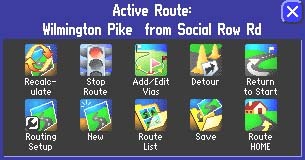 The Routes feature allows you to create new routes, edit routes you have saved, add midpoints, and add detours. You can also tell the StreetPilot 2730 that you want it to avoid certain areas or roads. You can have the unit display your track logs that show where you have been. There are also four available mileage logs. You can listen to music you’ve loaded on to the unit through the integrated MP 3 player. It will also play books you have bought from Audible.com and loaded on to the StreetPilot 2730. If you want, you can have the unit play the music or books through your car’s speaker system. Using the included XM Smart antenna, the unit can receive and use traffic information (requires subscription) with XM Nav Traffic. When a traffic message is received, the 2730 diplays the event on the map and can change your route to avoid the traffic incident. Also with a subscription, you can get XM Satellite Radio and Weather. Setting up the StreetPilot 2730 was easy – it really can be used right out of the box as the maps are pre-loaded. If you want to add files such as MP3 music or ebooks you need to load the USB drivers first, which goes quickly. When I switched on the unit here on my desk, it got a lock on five satellites and it was at least three feet from the nearest window. The 2730 uses a beanbag type friction mount to attach to the dash. It holds rather well, even when pushing on the screen for a touch command. 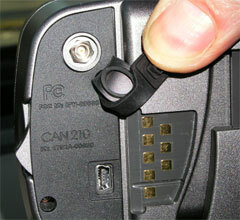 Included with the unit is an adhesive mount for a little neater mounting method. With both types of mounts you can swivel and tilt the unit and also remove it completely while leaving the mount in place. To test the routing, I wanted to go to a location that I did not know the address. So I made use of this handy feature: I go to the map, touch and drag to pan on the map until the location I want is in view. Then touch the location I want and select GoTo and the unit quickly calculates the route. The guidance voice sounded a little more “computer-like” than in other older models. I figured that the technology was supposed to get more realistic, not less. But it must be a trade-off because the voice now says the name of the next street on which to turn. This is the first unit I’ve had do this and I like it (the voice used to just say “turn left in 300 feet”). If for instance you have two streets close to each other, you can now tell exactly which street to turn on. That has occasionally been a problem in the past. But don’t get me wrong – the voice is still fairly good and easy to understand. I really wanted to test the XM Nav Traffic but the nearest coverage was a four-hour drive from my home and I couldn’t do that. The feature that allows you to hear the unit’s audio through your car speakers is pretty cool and easy to do. You tune to an unused FM frequency on your car radio and enter that frequency in the 2730. I was slightly disappointed that I could hear some static through the audio. That can be minimized with a little experimenting. I found a frequency that was a little better. This problem will also vary from car to car. At left is a photo of the power switch, external antenna jack, USB connector, and the power connector (I’m holding back the rubber connector covers with my thumb). Below is the GPS status screen. 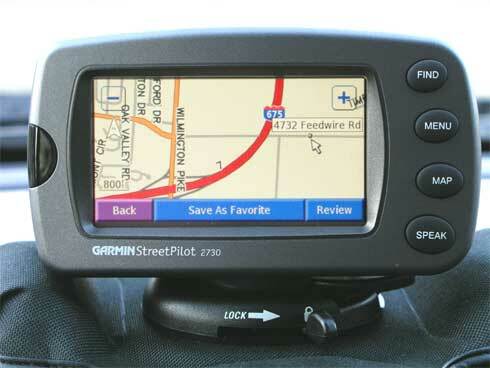 Garmin is a trusted name in GPS and the StreetPilot 2730 lives up to the Garmin name. Lots of great features, easy to use, and a good value. That said, it’s a little pricey if you’re not going to make use of the XM Nav Traffic, radio, and weather. Oh, what the heck – go for it!